It appears the market does (for now). The dismal jobs data sparked a kneejerk bond rally, sending yields plunging from the week’s highs, and stocks and gold jumped higher (we assume on hopes that bad news is great news for assets as Yellen will have an excuse to be more dovish). The initial moves are fading (as always) but stocks are still pushing higher. It has become axiomatic, for good reason, that the mining shares tend to lead the gold price whether they are moving higher or moving lower. For whatever reason, the connection is fairly solid and has been for many years. That being said, the combination of a deteriorating chart for the metal and the fact that the ratio ( HUI to Gold) is rolling over, does not bode well for gold at the moment. Take a look at the following chart noting the HUI/Gold ratio and comparing that to the Gold price ( dark blue line). Can you see the very close connection? You can almost lay the gold price atop this ratio and see where it is generally headed as the lines follow each other quite closely. 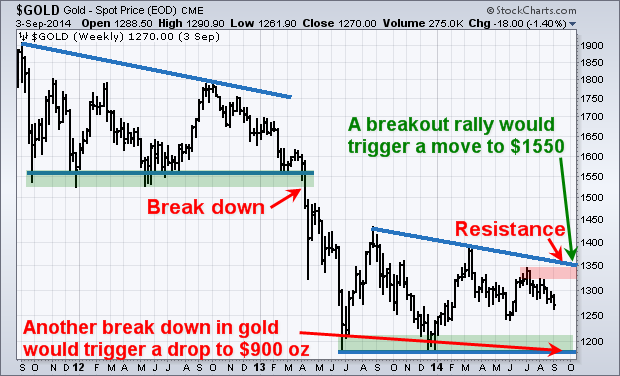 This post was published at Trader Dan Norcini on September 4, 2014. The Obama regime, economists, and the financial presstitutes have explained this decline in the participation rate as the result of retirements by the baby boomers, those 55 and older. In this five to six minute video, John Titus shows that in actual fact the government’s own employment data show that baby boomers have been entering the work force at record rates and are responsible for raising the labor force participation rate above where it would otherwise be. It is not retirees who are pushing down the participation rate, but those in the 16-19 age group whose participation rate has fallen by 10.4%, those in the 22-14 age group whose participation rate has fallen by 5.4%, and those in the 24-54 age group whose participation rate is down 2.5%. 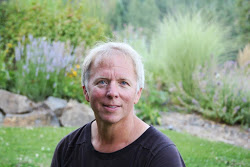 This post was published at Paul Craig Roberts on September 4, 2014. Gold and silver had a bad week, with gold falling $25 to a low of $1262 by the Comex close yesterday, and silver by $0.50. This morning UK-time prices opened a little better on overnight physical demand, no doubt stimulated by those lower prices. The background to this poor performance was dollar strength relative to weak currencies, with the yen, euro and pound all declining sharply. It feels like the market is drained of all positive sentiment, which is reflected in the very low level of open interest in the futures market. These conditions are more consistent with a market that is bottoming out than one that is about to fall sharply. Meanwhile retail demand seems to be stabilising, with growing interest for coins in the west, and weekly physical deliveries in Shanghai have quietly doubled over the last two months. Demand for physical gold has the stealthy effect of increasing the gearing of the shorts in the paper markets. However, it looks like the short sellers have returned in some force, with good Comex volume last Tuesday and healthy turnover again yesterday (Thursday). 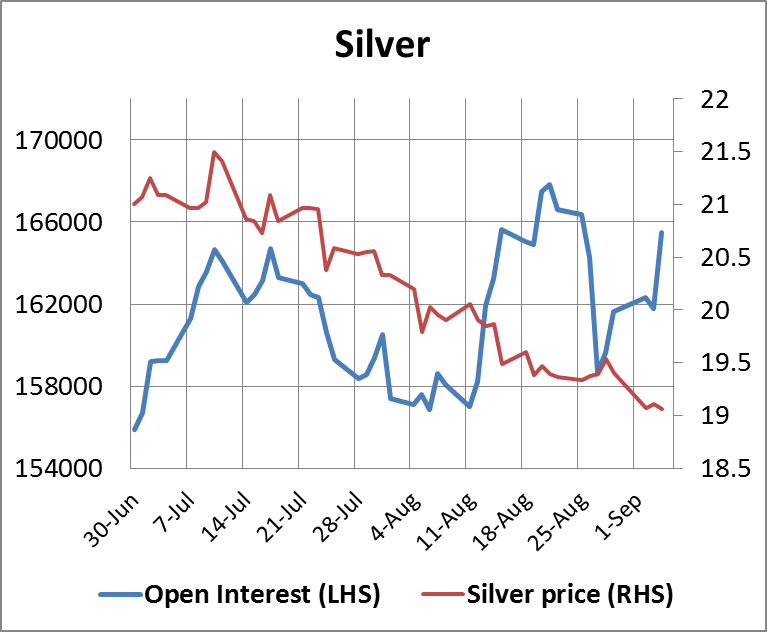 Open interest in gold rose, which with a falling price confirms futures are being driven by an increase in short positions, most probably in the managed money category. This is shown in the chart below, and is particularly noticeable since 27th August, the start of the current decline. This post was published at GoldMoney on 05 September 2014. The Federal Reserve Board of Governors, together with the Federal Deposit Insurance Corporation and Office of the Comptroller of the Currency – the top regulators of Wall Street’s largest banks – finalized liquidity rules yesterday that make absolutely no sense to anyone with a historical perspective on how Wall Street operates in a crisis. The Federal regulators adopted a new rule that requires the country’s largest banks – those with $250 billion or more in total assets – to hold an increased level of newly defined ‘high quality liquid assets’ (HQLA) in order to meet a potential run on the bank during a credit crisis. In addition to U. S. Treasury securities and other instruments backed by the full faith and credit of the U. S. government (agency debt), the regulators have included some dubious instruments while shunning others with a higher safety profile. Markets crash not from “bad news” but from the exhaustion of temporary stability. Yesterday I made the case for a Financial Singularity that will never allow stocks to crash. We can summarize this view as: the market and the economy are not systems, they are carefully controlled monocultures. There are no inputs that can’t be controlled, and as a result the stock market is completely controllable. Today I make the case for a crushing stock market crash that isn’t just possible or likely–it’s absolutely inevitable. The conceptual foundation of this view is: regardless of how much money central banks print and distribute and how much they intervene in the markets, these remain complex systems that necessarily exhibit the semi-random instability that characterizes all complex systems. This is a key distinction, because it relates not to the power of central banks but to the intrinsic nature of systems. One of the primary motivators of my work is the idea that systems analysis can tell us a great deal about the dysfunctions and future pathways of the market and economy. Systems analysis enables us to discern certain pathways of instability that repeat over and over in all complex systems–for example, the S-Curve of rapid growth, maturation and diminishing returns/decline. This post was published at Charles Hugh Smith on THURSDAY, SEPTEMBER 04, 2014. Some investors tend to believe the stock market is a perfect and balanced barometer of the underlying economy. Even with the recent bubbles in technology stocks and real estate, some still have this misguided assumption that stock values are always priced right. Most of the movement in the market is being driven by institutional investors since roughly half of Americans own absolutely no stocks outright. It should be rather obvious to those that read a few newspapers outside of the country that there are some major risk factors hitting the world right now: the Ebola outbreak, the conflict between Ukraine and Russia, and the Middle East. You also have anemic economic growth in Europe. In the US 92 million Americans have dropped out of the labor force. Yet somehow, the stock market is making new highs. Why? A large part of profits have come from firing workers, slashing wages, cutting benefits, and using cheap QE funding to juice up stocks. The market cares only about profits, not long-term sustainability. Yet if you were looking at the volatility index you would think that there was absolutely no risk in the current market. This market is looking very bubbly. Bubbles are hard to define and spot. Bubbles are largely driven by psychology and emotions and move in an eradicate fashion. A bubble occurs when an asset, commodity, or stock for example moves up in price with very little economic fundamentals to support it. For example, real estate moving up with no actual income growth but people using leverage to go deep into debt. Some tech companies today are looking very bubbly based on their earnings. This post was published at MyBudget360 on September 5, 2014. In a radio interview recently* I was asked a question to which I could not easily give a satisfactory reply: if the gold market is rigged, why does it matter? I have no problem delivering a comprehensive answer based on a sound aprioristic analysis of how rigging markets distorts the basis of economic calculation and why a properly functioning gold market is central to all other financial prices. The difficulty is in answering the question in terms the listeners understand, bearing in mind I was told to assume they have very little comprehension of finance or economics. Gold should be treated as a currency, according to India's top gold refiner, MMTC-Pamp. The organisation is working on a gold metal account scheme that would help small retail gold consumers deposit their gold, melt and earn interest on it. In a move aimed at mitigating the meagre gold supply situation across the country, which has led to a high current account deficit (CAD) and leading to high imports, the organisation has proposed a Gold Monetisation Scheme (GMS). The scheme will ensure that gold deposits will be treated just as currency deposited in a bank and earn interest. The Ukraine-Russia crisis and economic weakness in Europe and Japan have been supporting gold somewhat, but prices are being pressured by Federal Reserve policy, said Jeffrey Currie, head of commodities research at Goldman Sachs. That's why he sees the precious metal falling 17% from current levels by year end. Sales of the US Mint American Eagle gold bullion coins slumped again in August following the fall off in demand seen in July. August sales of 25,000 ounces dropped by 16.6% or 5,000 ounces from July’s total of 30,000 ounces. 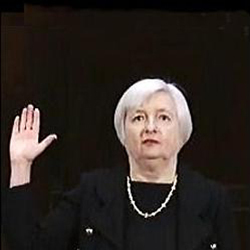 He is cutting interest rates to the bone. He is charging banks even more to park their money. And he is using the central bank’s financial muscle to spur lending. But the question is whether the new actions, announced on Thursday, will be enough to fix Europe’s problems. If they don’t, Mr. Draghi doesn’t have many options left. As I approached the final life-cycle stage of retirement, I naturally began to think back to the retirement of my parents and marveled about how well they did without much retirement income. With little more than 40% or 50% of their pre-retirement income, largely from Social Security, they lived well and even managed to multiply their net worth in retirement. This seemed to fly in the face of much of the fear promoted by the financial services industry that retirement isn't possible unless people could generate 75% or even more of what they earned in their last years of work.